A couple years ago, Jaime came across a stack of old letters, photos, and documents. The papers seemed to have belonged to Isabell (Tuttle) Winchell who lived in Brighton, Colorado. 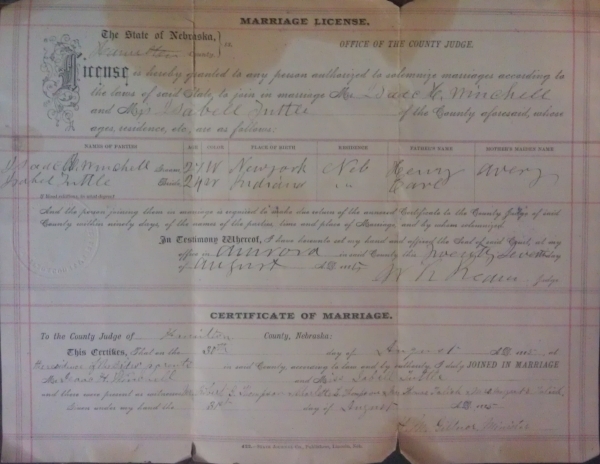 Among the papers is her marriage certificate to Isaac Winchell. 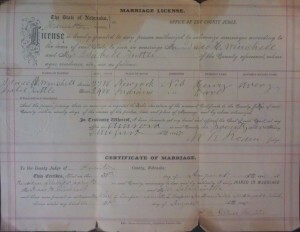 The two married on August 30, 1885 in Hamilton County, Nebraska. He was 27, she was 24. Another of the papers was a geneology of Isabell’s side of the family dated in September 1904. Isabell also kept cancelled checks datign back to 1923. Only her name appears on the checks, which makes me think her husband had likely died by that date. Other letters in the stack include the name Earl Winchell who seems to have been their son. Isabell’s father and brother were also named Earl according to the marriage license and the geneology. The last document with Isabell’s name is dated in 1950. I’m guessing her death was around that time. That would make her about 90 years old, having been widowed for roughly 30 years. Interesting to see a person’s life laid out in front of us like that. I’d wish I could find Isabell and Earl’s descendants to give them this link to their family history. Last Saturday I had to send a package that needed to get there by Monday. Unluckily for me, Monday was Columbus day and the U.S. Post Offices were closed. No deliveries. But the clerk told me I could get a Monday “holiday” delivery by 3:00 pm. I took it. Well, the package didn’t get there. So yesterday I took the receipt to the post office to get a refund. She went into the back to confirm the package was late. She came back and said she would be glad to give me a refund but I needed the copy of the shipping label. This was strange because she had a receipt with the tracking number, shipping date, and delivery guarantee, but that didn’t matter. She need the shipping label that contained all the same information. Sigh. Thankfully, I had the shipping label in the car. I went out to the car and came back with the label. Of course there were a couple people in front of me in line by the time I got back. I eventually ended up back with the same clerk. At least I didn’t have to explain the whole story to someone else. The shipping label satisfied her and she started the process for the refund. This is where it gets funny. She had me fill out a refund form. While I was doing that, the clerk told me that because of the amount of the refund, she had to pay me with a money order. Annoying, but I realized she didn’t make the rules. No use yelling at her for it. She then used the form I filled out to complete the money order. She had to write my name, address, reason for the money order, and then run it through a printer to fill in the amount. Then she asked to see my ID to make sure I was the person she just filled out the money order for. Really. And that is an example of how the USPS has reached its current level of efficiency.